Most of the time I tend to plan out my Road Trips For Food by giving people ample notice to maximize the number of people able to attend. A text last week from my cousin Jackie in Nashville changed this approach with two words and a symbol, Buns & Buns. Jackie asked if I had heard about the restaurant in South Miami and then shared some of the restaurant’s accolades, such as participating in Bravo’s Best New Restaurant. I took one look at the menu and I, immediately, called to find out that they do make their desserts in house. I knew it would be a stretch to get a group of people to drive down that weekend to South Miami (it’s about a 90 minute drive each way) but fortunately for me, I have a lot of sorority sisters in the area and friends in Broward County who would only have a 50 minute ride. 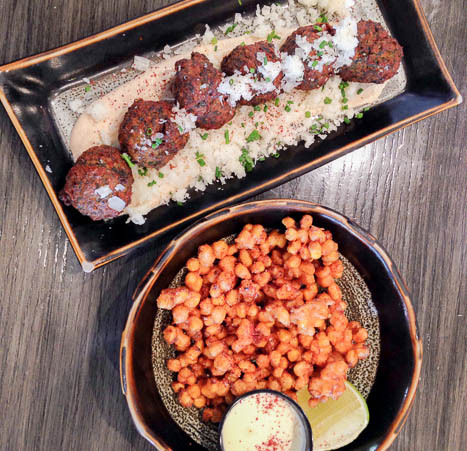 Owner Alex Zibi dubs the concept, ‘gastro-fast’ which means fine dining served in under 20 minutes for under 20 dollars. I read that customers walk up to the counter to order and then sit down to be served. When we were there, orders were taken at the table. Spinach Poofs and Corn Fritters. Walking in to the restaurant felt like I was walking into an inviting space. It’s bright, airy and does not give the impression that everything will be served lickety split. But it was and with fabulous and friendly service from Percy and Lucy. We ordered two appetizers to start. 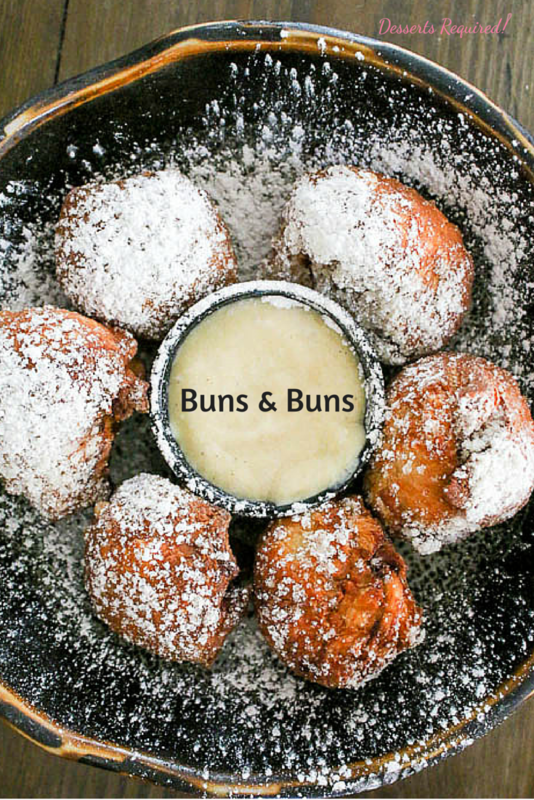 The Corn Fritters are whole kernel clusters fried in beer batter and served with lime and an aioli sauce. The Spinach Poofs are creamy spinach balls that are coated and fried and then served on a bed of tahini with manchego cheese and chives. I loved the creativity of using whole kernels and I wanted to dunk everything into the aioli sauce. As for the Poofs, they were like eating a crunchy version of cream of spinach. Both were divine. Ciabatta Bun, Brioche Bun, Tuna Burger, Brisket & Fried Eggs and Citrus Mediterranean Salad. As was par for the course when dining with six women and one man, five people ordered one of the four gorgeous salads. Lori ordered the Tuna Burger and Rob ordered the Brisket & Fried Eggs that was served with truffle sauce and portabello mushrooms on homemade toasted ciabatta. The dishes were all fresh, delicious and beautifully presented. Again, not what any of us would associate with fast food. The breads and buns may be ordered separately. Since I wanted to try them, I ordered the Ciabatta Bun (which comes toasted), Brioche Bun and Steamed Buns. All were perfectly baked. 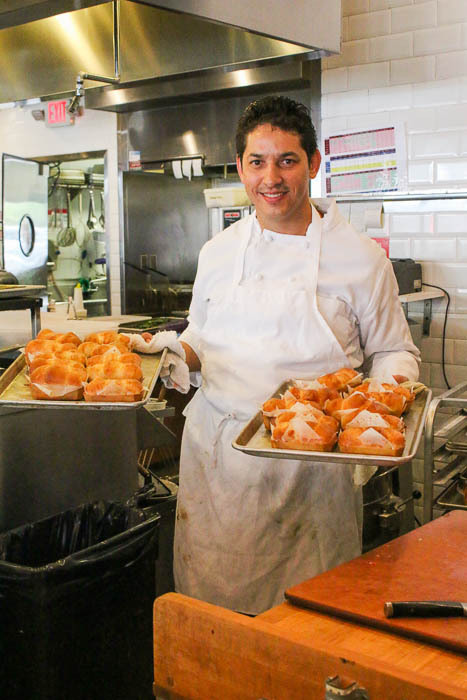 Brioche buns fresh out of the oven. All four desserts were tried, as well. The Loaded Fruit Sorbet consisted of three flavors of sorbet. They do not make the sorbet in house but order it from a shop on South Beach. I thought this was great because I am a huge fan of local businesses supporting other local businesses. 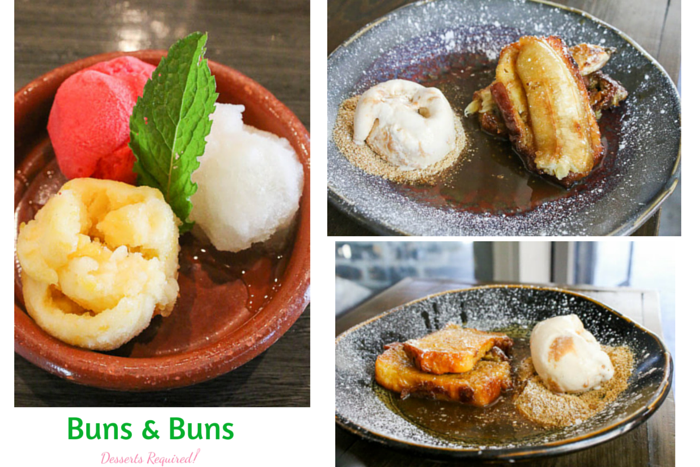 Fruit Sorbet, Nutella Stuffed French Toast and Torreja. I am not a huge donut eater but my friend and fellow blogger Cheryl from Pook’s Pantry could live on them. 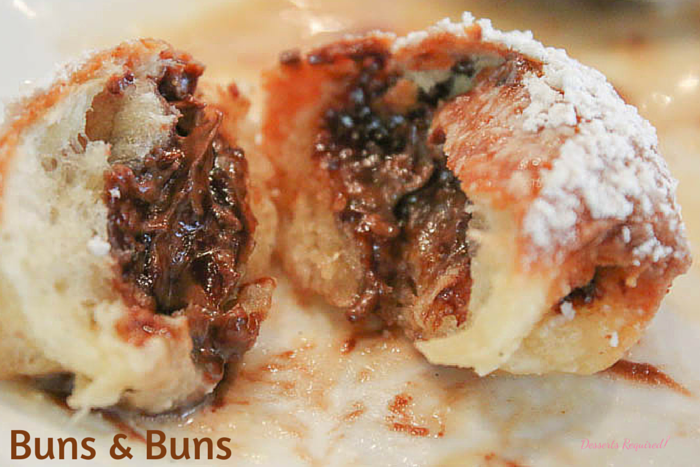 Knowing that Cheryl relished each bite is what I call a resounding endorsement for the Hot Nutella Buns. French toast on the other hand is something that brings back wonderful memories of when my big kids were little and I would make French toast out of homemade challah. I am often disappointed by French toast that I order from restaurants because the bread is lacking. 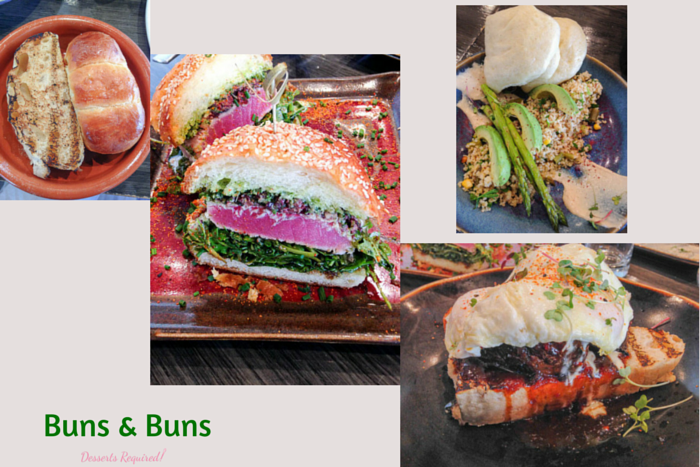 At Buns & Buns, the bread is out of this world. The Nutella Stuffed French Toast could use a bit more nutella because one piece of the bread did not have any nutella near it; but otherwise the taste of this and the Torreja is out of this world. As stuffed as I may have felt by the end of the meal I could not leave the last few bites of Torreja on the plate. Many thanks to Cheryl, Victoria, Teresa, Debbie, Lori and Robert for a fabulous Road Trips For Food! The seven of us left the restaurant with the knowledge that return trips are required. 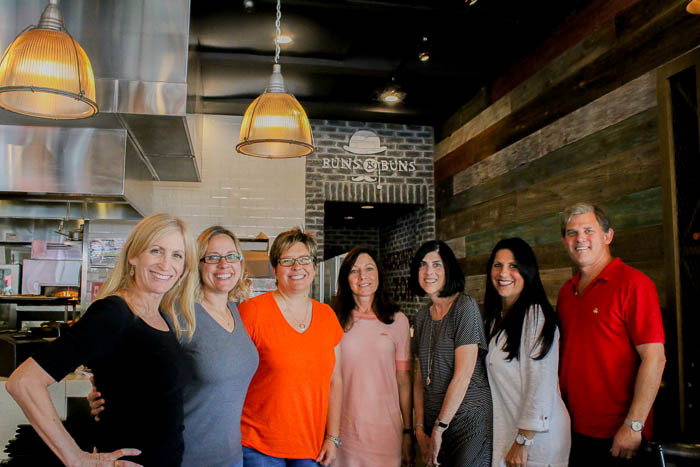 Buns & Buns is a treasure in South Miami with wonderful fast service, fresh ingredients, comfort food, delicious desserts and reasonable prices. Totally worth the 90 minute each way drive! Thanks, Christina. We had a blast and the food was delicious! Great review Betsy! I’m not close to Buns and Buns restaurants but I’m glad to hear an establishment has actually made fast food fresh and delicious. That would be a good trend to get started! Thanks so much, Diane. Who knows…maybe Buns & Buns will open near you!! Such a beautiful company and the desserts are so mouthwatering! The desserts were delicious. I am still craving the french toast! We are getting some new restaurants in the Cleveland area. This one sounds like one I would love to see here- different from the usual offerings and delicious. Sounds like a great place, all the food looks and sounds delicious! I want some of the corn fritters right now! Wow, it looks like you did some amazing eating- I’m jealous! With good reason, Jessy! 🙂 Thanks so much for checking it out.